I am a weaver and felt maker. 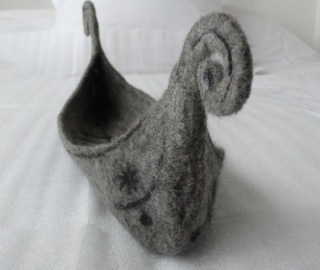 I love this project, as a felt maker I have long had an interest in making contemporary felt pieces as beautiful objects inspired by prehistoric pots, especially celtic and beaker pottery. 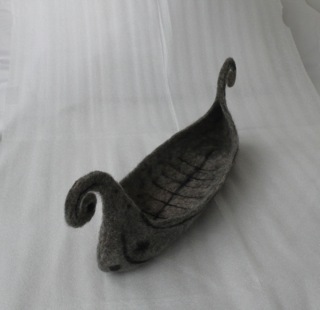 Looking at the motifs of the Bronze Age artefacts I made a felt ship, using Gotland wool, an ancient sheep breed first established on the island of Gotland in Sweden by the Vikings. I thought the natural colours of the wool worked well. Also included is a felt vessel featuring simple sun motifs. 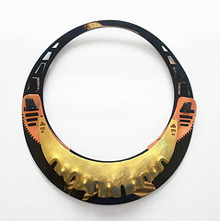 I would love to get involved with similar projects relating to the Bronze Age. Please see my work at www.pathopewell.com.